eScienceCommons: Should killer whales be captive? Should killer whales be captive? The tragic death of killer whale trainer Dawn Brancheau in Florida, after a 12,000-pound orca named Tilikum pulled her into a tank, has raised new questions about the confinement of dolphins and whales in theme parks. eScienceCommons discussed the topic with Emory neuroscientist Lori Marino, an expert on the brains of cetaceans, which include porpoises, dolphins and whales. Q: What are some common misconceptions about killer whales, also known as orcas? Marino: Killer whales are actually dolphins. They are called whales because they are the largest dolphins, but they are in the same family as the bottlenose dolphin. Although they are top predators, they are not naturally aggressive to people. I have colleagues who research orcas and swim with them in the wild. People will go out in very small boats and paddle among orcas. They could easily reach up and grab you and gobble you up. And yet there is not a single incident of an orca injuring, let alone killing, a person in the wild. Q: What do we know about killer whale intelligence? Marino: The orca brain is the most convoluted brain on the planet. These are very, very intelligent animals with major, impressive brains. I think people would be surprised to know that orcas form cultures in the oceans, and they pass these on through generations. It’s stunning. Different groups of orcas make distinct sounds and we call these dialects. It’s like a Brooklyn accent versus a Manhattan accent. Orcas have really creative ways of getting prey. In the Arctic, a sea lion may try to escape them by getting on a floating chunk of ice. A group of orcas will form a line and rush forward together to create a wave to make the ice chunk wobbly and throw the sea lion into the water. You see a lot of group cooperation like this among orcas. Q: Why are you so strongly against keeping killer whales and other cetaceans in theme parks? Marino: The normal range of an orca is several 100 kilometers per day, and they like to dive really deep. They don’t have room in these tanks to swim as far as they would like to. There is no evidence that they kill each other in the wild, but they have been known to kill each other in captivity. When you take all of that energy and put it into a small tank, a lot of stress builds up and it’s like a perfect storm waiting to happen. I understand that people want to see these animals up close, but I want people to understand the price that the animals are paying. What happened at SeaWorld is tragic all around, for the trainer who lost her life and for the whale. What do you think? Should killer whales be kept in theme parks for entertainment? What's in a dolphin's tool kit? I agree 100% with Dr. Marino. Orcas are simply inappropriate creatures to keep in tanks and pools, particularly for entertainment thinly masked as supposed "education." This latest tragedy simply underscores this fact. We need to phase these marine attractions out, starting now. Unfortunately this will not happen as long as these places remain so lucrative. People need to stop buying tickets. why do humans believe that everything on this planet is for our enjoyment? They belong in the ocean, just like zoo animals belong in their natural habitats. Sadly instead of decreasing sales to see these animals abused this will only make ticket sales skyrocket. After all we now know, or rather have been reminded, just why we call them "killer" whales. Whichever marine biologists thought that showcasing killer whales was an acceptable idea are just absurd. It is very sad that many people do not value ALL life and ALL living creatures as much as they value the almighty dollar. These animals are magnificent creatures who were never intended to live in captivity for the sake of entertaining the human race. What a pity! I am quite disgusted by what I have seen at Sea World. They claim to be trying to educate people when really they are nothing more than a circus with the animals being made to perform to attract customers. While I do realize that some species of marine mammals, including some dolphins, do appear to survive well in captivity, that is not the case with orcas. If you take a look at Tilikum, you will notice that he has a collapsed dorsal fin, a feature that is rarely ever observed in wild orcas. 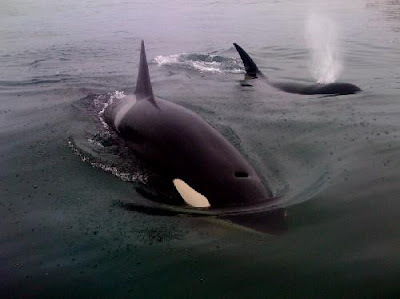 In fact, the only time that collapsed dorsal fins occur in wild orcas is when they are ill. These animals are not living healthy, happy lives. Captive orcas have considerably shorter lifespans than they would have in the wild. Considering the magnificence and tremendous intelligence of these creatures I just think that it is inhumane to keep them in small tanks and have them entertain people at the animals' expense. Some of the animals/ Whales kept in Sea word are in no conidion to be let out in the wild ( People should just let the animals that can not be free not in shows) . But to take them out of the wild and put them in shows I do not agree if you take them out of there natural don't be surprised if they attack !